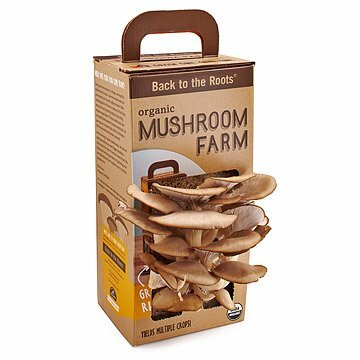 Grow a batch edible oyster mushrooms with this easy-to-use indoor mushroom growing kit. With just a spray of mist twice a day, this low-maintenance, DIY mushroom kit will grow up to a pound and a half of gourmet pearl oyster mushrooms in as little as 10 days! Everything you need to get growing—the mister, instructions and box—is included, plus a natural soil substrate composed of recycled plant materials, such as corncobs, wheat bran, and oak shavings. Each kit grows 2–4 crops. Made in Oakland, California. 4.5" L x 3.5" W x 11" H; 3 lbs. Please note: This box contains a living mushroom root, so don't be surprised by what's inside! Most kits, when opened, will contain a white substance; this is the healthy mycelium (mushroom roots) ready to grow as soon as it's slit open. Kits are inoculated with oyster mushroom spawn after being thoroughly sterilized. We have had the product up for 8 days now. We followed the directions as stated and it has not grown anything except for mold. This is the first item I have purchased from Uncommon Goods that is not an excellent product. Fabulous gift for foodies who already have all their kitchen gadgets in order. Nice to give consumable things instead of trinkets, which everyone has enough of. My husband loved this and did not wait until the holidays to start it up. (Now I have to find something else for him) The first one I ordered was damaged when it came. Uncommon Goods replaced it immediately, no hassle. Customer service was excellent, personable, AND...the FIRST voice prompt on their customer service line is "to talk to a representative." Thank you very much. From the pictures I have seen the product seems to be very good and a big hit with my dad. This is great - easy to set up and fast-growing. It is so much fun to watch because from hour to hour you feel as though you can actually see the mushrooms grow because once they sprout it is so fast. It is a pleasure to produce fresh mushrooms in a small spce. I thought this was a good buy when I thought it only grew one batch of mushrooms, but now I find out it grows two batches and then can be used for a tomato patch. Watching them grow has entertained my dad for two weeks already - and he loves to cook, so preparing and eating them is fun, too. I gave this as a gift for father's day. My dad was really excited to receive it. It is a different type of gift and something that is not what you'd find at a store. Followed the instructions by soaking for 8 hours and then placing back in the box, misting at least twice a day, and waiting......still not even a single mushroom has sprout. I think this was a very cool gift. I have yet to see if they grow, it's just barely the end of winter. But I love that they are organic. And it's just different. And unique. And if I got this gift I would be psyched!! Very fun, easy to grow, and good to eat! I was such a hit I during the first time I bought it, this is the third time I've purchased it. Amazing gift.